This screwdriver/flashlight key set is great for emergencies, outdoors, boating, camping and much more! Available in black/white (WL1008X), blue/white (WL1007X) and red/white (WL1006X). A magnet holds the screwdriver in place and a metal split ring allows for easy access to your keychain. 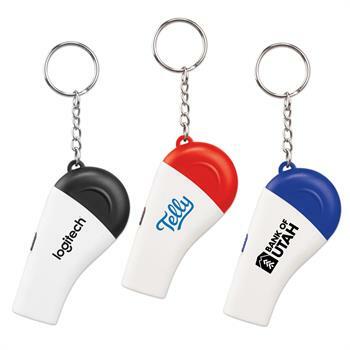 Customize with an imprint of your company name and logo for maximum brand exposure! One location imprint. Imprint Size : 1 3/4" x 5/16"
Size : 3" x 1 5/18"